Some marble and granite installations require complex restoration and maintenance techniques. An example is this ‘agglomerate’ style patchwork floor Sungloss maintains for a downtown Chicago client. Sungloss President Mike Pavilon, Consultant Stan Dembouski, and Interior Designer Samantha Brossell observe refinishing techniques employed by Refinishing Specialist Patricio Gabler on a blue granite bar top in downtown Chicago. Account Representative John Leonard inspects this Chicago condominium granite lobby floor while Refinishing Specialist Rodney Brown cleans and seals the reception desktop. Household cleaners and sprays have damaged this black marble shower. Marble should be cleaned with a neutral (non-ionic) stone soap, preferably a ‘rinseless’ variety, with clean cotton rags or white nylon cleaning pads. A stunning combination of white marble and black granite make this floor a beauty to behold and somewhat of a challenge to maintain. Different procedures are needed for granite and marble refinishing. This Mexican terra cotta floor was restored by deep cleaning first and then applying a top coat seal to bring back the shine of the worn-off glaze. Please take a moment to read a few selected references. 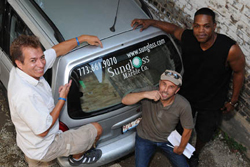 Sungloss’s customers are extremely pleased with our employees and our services. We highly value our customers’ opinions. In order to learn what they think, we send a questionnaire to each one after we have completed our work. The feedback we receive is greatly appreciated and helps us continue to improve and strengthen our company. Of those responding to our survey, more than 98% have rated our service as excellent and our pricing as very reasonable. Our representatives have been described as prompt, knowledgeable and courteous. Not least, our estimates were rated as accurate and were submitted in what was regarded as a timely fashion.